1.) Read Alberta Laser Rehabilitation Centre’s successful case in treating Lisfranc Fracture. The stimulating effect of low level laser phototherapy on bone healing has been shown in a number of in vitro and animal studies. However, the effect of LLLT on the bone healing in human has not been previously wide demonstrated. The article reports an accidentally injury pattern and reported as fractures of the mid third of the left tibia. 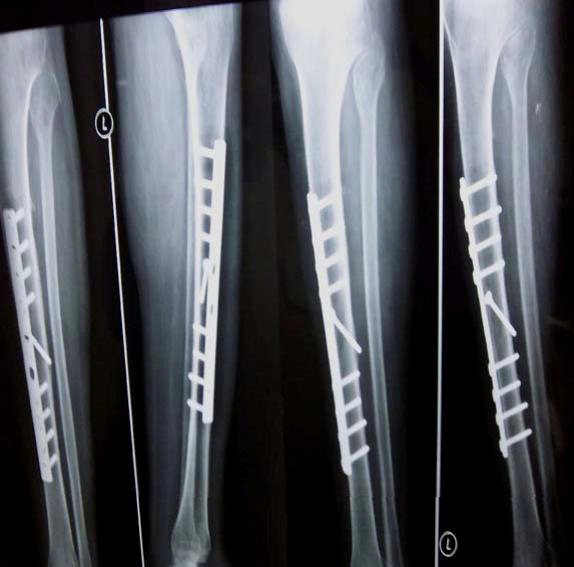 The purpose of this case study was to demonstrate the biological effects of low-level laser therapy (LLLT) on tibial fractures treated surgically using radiographic, examinations. 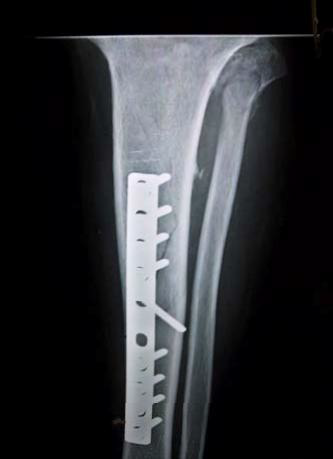 CASE REPORT: The case hospitalized for conventional surgery and followed by applying Low Level Laser Therapy LLLT to enhance and accelerate the bone fracture healing of the left tibia using the effect of laser bio-stimulation. Radiological x-ray imaging evaluation follow up for our case showed a significant bone healing rate as result of exposure of Diode Laser 650 nm with energy density of 5 J/cm 2 three times/week for one month. Radiographic findings revealed no significant fracture callus thickness difference before using LLLT however, the fractures showed significant callus formation after using LLLT. The most commercially available lasers are the Helium-Neon (He-Ne), emitting wavelengths of 632.8 nm, and the semiconductor diodes, such as gallium- arsenide (GaAs) and gallium-aluminum- arsenide (GaAlAs), emitting wavelength of 650 and 830 nm, respectively. Their characteristics include the absence of thermal and deleterious effects to the human body, promoting bio-stimulation of cells and thereby improving regenerative capacity. [1-5] This paper reports recent follow up for tibia bone fracture case with delayed fracture healing, reporting the observations on the effect of LLLT on bone fracture healing. 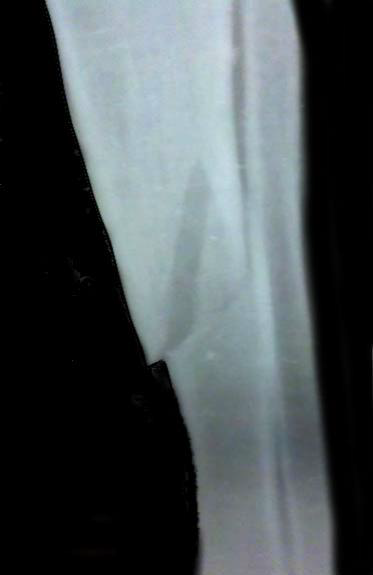 Fig (1) showed longitudinal oblique fracture at the mid third of the tibia. Fig (2) showed delayed bone healing & callusformation. Laser Evoked Bio-stimulation for Bone Fracture Healing (Case Report Study) So we have continued follow up the case by using Low Leve Laser Therapy LLLT application for bone healing bio- stimulation. LLLT sessions were used applying energy density 5 J/cm 2 (6-7). The results of this case study suggest that LILT significantly accelerates bone regeneration and healing in humans. The irradiation parameters and protocol used in this study were successful in decreasing treatment time. As a consequence, future perspectives of this work are decreased treatment costs and less discomfort for the patient. Further studies are still required to explain the mechanisms of LILT and more clinical trials are necessary to optimize treatment parameters. Reddy GK. Photobiological basis and clinical role of low-intensity lasers in biology and medicine. Journal of Clinical Laser Medicine & Surgery. 2004;22(2):141-50. I n i t i a l effects of low-level laser therapy on growth and differentiation of human steoblast-likecells. Stein E, Koehn J, Sutter W, Wendtlandt G, Wanschitz F, Thurnher D, Baghestanian M, Turhani D.Department of CranioMaxillofacial and Oral Surgery, Medical University of Vienna, Austria. Wien Klin Wochenschr. 2008; 120(3-4):112-7. Luger EJ, Rochkind S, Wollman Y, Kogan G, Dekel S. Effect of low-power laser irradiation on the mechanical properties of bone fracture healing in rats. Lasers Surg Med 1998; 22:97-102. Infrared laser light further improves bone healing when associated with bone morphogenic proteins: an in vivo study in a rodent model. Gerbi ME, Marques AM, Ramalho LM, Ponzi EA, Carvalho CM, Santos Rde C, Oliveira PC, Nóia M, Pinheiro AL. School of Dentistry, Federal University of Pernambuco, Recife, PE, Salvador. Photomed Laser Surg. 2008 Feb;26(1):55-60.
. Sommer AP, Pinheiro ALB, Mester A, Franke RP, and Whelan, HT (2001): Biostimulatory windows in low intensity laser activation: Lasers, Scanners and NASA’s Light Emitting Diode Array System. Journal Clinical Laser Medicine and Surgery,19:29 – 34. Kawasaki K, Shimizu N. Effects of low-energy laser irradiation on bone remodeling during experimental tooth movementinrats.Laser SurgMed 2000;26(3):282-91. Pereira CL, Sallum EA, Nociti FH Jr, Moreira RW. The effect of low-intensity laser therapy on bone healing around titanium implants: a histometric study in rabbits. Int J Oral Maxillofac Implants. 2009 Jan-Feb;24(1):47-51. AboElsaad NS, Soory M, Gadalla LM, Ragab LI, Dunne S , Za la ta KR, Louca C. Effect of soft laser and bioactive glass on bone regeneration in the treatment of bone defects (an experimental study). Lasers M e d S c i . 2009 Jul;24(4):527-33. E pub 2008 Jul 15. PreviousPrevious post:Manual Osteopathy And What Can It Do For You!